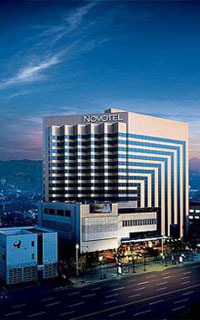 Novotel Ambassador Doksan, the only international luxury hotel in Southern Seoul, held its 10th anniversary ceremony on Sept. 11, 2007. The ceremony, hosted by the general manager, Mr. Rodney Trutwein and the staffs, was prepared to thank its guests and business partners who supported the hotel for 10 years while looking back at the 10 years of history full of achievements. The ceremony was participated by a number of special guests including Mr. Suh Jungho (the chairman of Ambassadors Group), Mr. Han Insoo (the chief of Geumchongu district), Mr. Lee Mokhee (senator), Mr. Kim Sungsup (professor at Sejong University, Dept. of Hotel & Tourism), Mr. Cho Minho (professor at Hanyang University, Dept. of Tourism) and representatives of Accor-Ambassador hotels. With beautifully decorated with outdoor sculpture and 10th anniversary emblem, the ceremony provided guests with standing buffet followed by video footages of hotel history and celebration messages from patrons from all over the world. The evening reached its peak with a dynamic performance by BMK, a top female soul singer. We've made a history here for last 10 years when people had doubts of our success. Now, we are still overcoming a lot of uncertainties and I do believe that this area has a great deal of potentials to be developed. Also, we have our guests who support us and our talented staff did a wonderful job of hosting this ceremony. This is the powerful asset of Novotel Ambassador Doksan and the origin of our competitiveness. "With what we've learned for last 10 years, we will stay committed to further achievements and, contribution to our community as well" said the general manager, Mr. Trutwein. Novotel Ambassador Doksan, opened as the second joint venture between Accor and Ambassador Group, has successfully beaten up the doubts of its success by achieving astonishing growth over 10 years of business along with the transformation of its community into the home of IT industry.